Ambrogio Maestri is one of the most in- demand opera singers in the world, but if it all ended tomorrow he could probably forge a new career as a television chef. 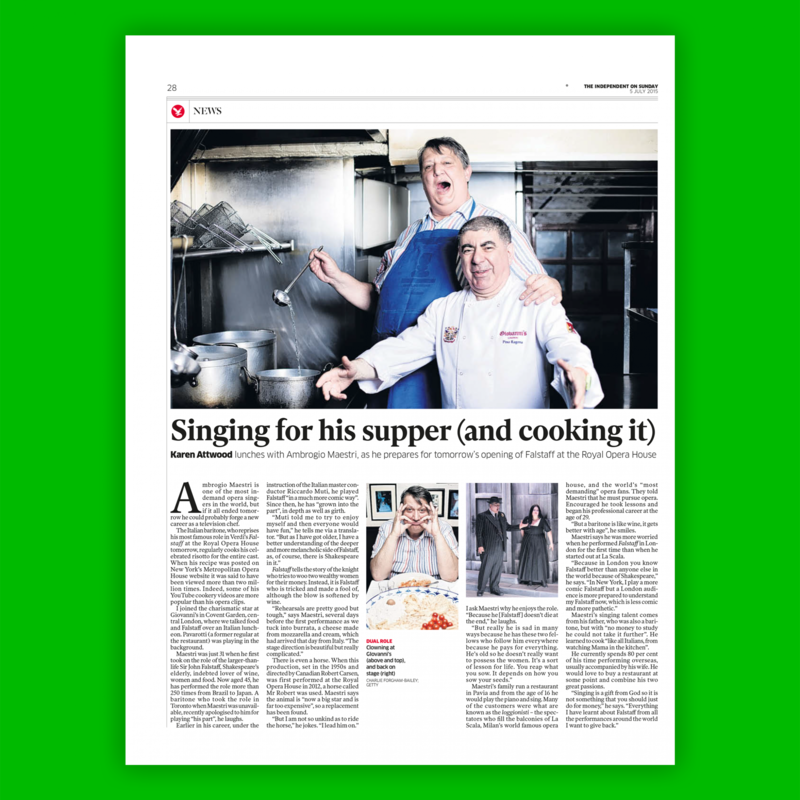 The Italian baritone, who reprises his most famous role in Verdi’s Falstaff at the Royal Opera House on Monday, regularly cooks his celebrated risotto for the entire cast. When his recipe was posted on New York’s Metropolitan Opera House website it was said to have been viewed more than two million times. Indeed, some of his YouTube cookery videos are more popular than his opera clips. I joined the charismatic star at Giovanni’s in Covent Garden, central London, where we talked food and Falstaff over an Italian luncheon. Pavarotti (a former regular at the restaurant) was playing in the background. Maestri was just 31 when he first took on the role of the larger-than-life Sir John Falstaff, Shakespeare’s elderly, indebted lover of wine, women and food. Now aged 45, he has performed the role more than 250 times from Brazil to Japan. A baritone who took the role in Toronto when Maestri was unavailable, recently apologised to him for playing “his part”, he laughs. Earlier in his career, under the instruction of the Italian master conductor Riccardo Muti, he played Falstaff “in a much more comic way”. Since then, he has “grown into the part”, in depth as well as girth. Falstaff tells the story of the knight who tries to woo two wealthy women for their money. Instead, it is Falstaff who is tricked and made a fool of, although the blow is softened by wine. There is even a horse. When this production, set in the 1950s and directed by Canadian Robert Carsen, was first performed at the Royal Opera House in 2012, a horse called Mr Robert was used. Maestri says the animal is “now a big star and is far too expensive”, so a replacement has been found. “But I am not so unkind as to ride the horse,” he jokes. “I lead him on.” I ask Maestri why he enjoys the role. “Because he [Falstaff] doesn’t die at the end,” he laughs. Maestri’s family run a restaurant in Pavia and from the age of 16 he would play the piano and sing. Many of the customers were what are known as the loggionisti – the spectators who fill the balconies of La Scala, Milan’s world famous opera house, and the world’s “most demanding” opera fans. They told Maestri that he must pursue opera. Encouraged he took lessons and began his professional career at the age of 29. “But a baritone is like wine, it gets better with age”, he smiles. Maestri says he was more worried when he performed Falstaff in London for the first time than when he started out at La Scala. Maestri’s singing talent comes from his father, who was also a baritone, but with “no money to study he could not take it further”. He learned to cook “like all Italians, from watching Mama in the kitchen”. He currently spends 80 per cent of his time performing overseas, usually accompanied by his wife. He would love to buy a restaurant at some point and combine his two great passions.